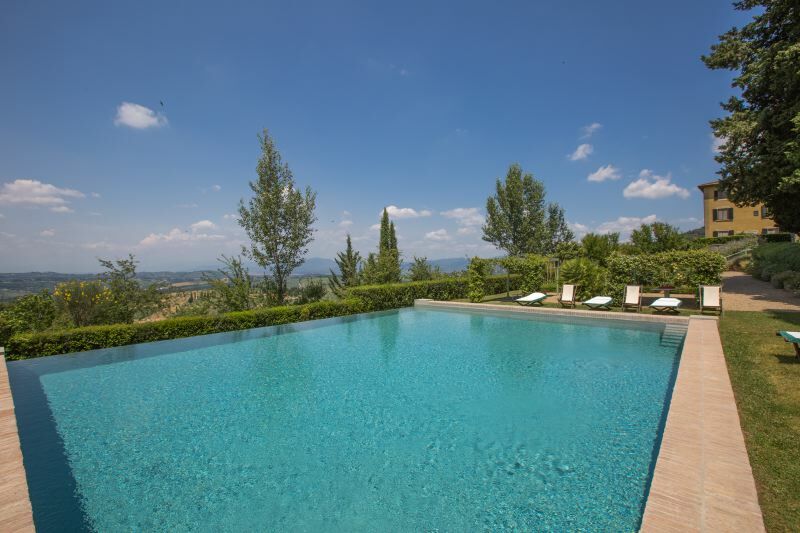 Villa di TIzzano is situated 15 km away from the center of Florence, in the Chianti Classico district. 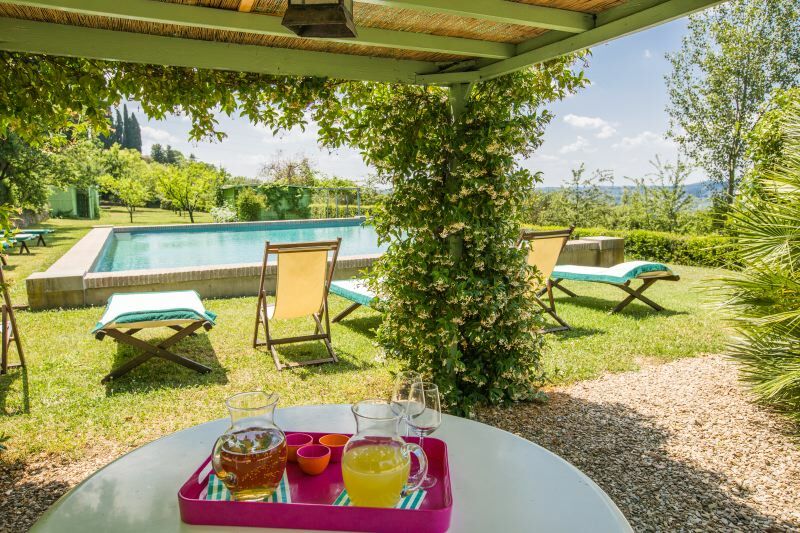 It is a period residence consisting of a large complex containing a villa, tower, romantic park and French-style garden that has a large infinity swimming pool with views of the gentle Chianti hills. The private park (over 10,000 m2) was restored in 1930 by the British garden designer, Cecil Pinsent, and divided into two large terraces featuring an olive-grove, cypress-trees, fruit trees and a vegetable garden. The beautiful view of the hills even offers a glimpse of the dome of Florence cathedral. Next to the swimming pool (9 x 11 m) there is a spacious solarium area with deck chairs and sun-beds and two covered pergolas. The barbecue area opposite has a changing-room and shower. In front of the villa, on the large panoramic terrace, there is a big a gazebo furnished with tables and chairs. The interiors are elegantly furnished with period pieces enriched by decorative details that contribute to maximizing the traditional style, whilst still being practical. The villa has WI-FI internet connection, mosquito screens and air conditioning in the bedrooms. A breakfast service is provided and it is possible to request a chef for preparing meals or organizing cookery courses. Services to be paid for on site. From Villa di Tizzano it is possible to explore interesting food and wine itineraries throughout the Chianti district or easily travel to Florence, the cradle of the Tuscan Renaissance. GROUND FLOOR: spacious entrance; three living-rooms, one with satellite TV, the second with Renaissance-style fireplace, the third with a library and exit leading into the garden; two elegant dining-rooms; a large, well-equipped kitchen with dishwasher, oven and microwave; 1 downstairs bathroom with shower. FIRST FLOOR: 1 double bedroom with bathroom and shower; 1 twin bedroom with bathroom and shower; 1 double bedroom with bathroom with bathtub and shower. SECOND FLOOR: 1 double bedroom with bathroom and shower; 2 bedrooms with two beds (that can be transformed into doubles) that share a bathroom with bathtub and shower; 1 suite with double bed; 1 double bedroom with large bathroom with bathtub, shower and double washbasins ; 1 sitting-room with treadmill. TOWER: sitting-room with fireplace; 1 double bedroom with bathroom with shower; 1 twin bedroom with bathroom with bathtub and shower. All the bedrooms have mosquito screens on the windows and air conditioning.